The North-East, and Manipur in particular, have emerged as major sports hubs in the country. In the last of a three-part series peeking into the lives of three young sportswomen from the state, Shail Desai tracks footballer Yumnam Kamala Devi’s meteoric rise to the top despite all odds. While growing up in Nongpok Sekmai in the Thoubal district, she preferred to play (cricket, sepak takraw or football) with the boys. And for this, she was constantly reprimanded by her parents. “Firstly, there just weren’t enough girls around my home to form a team. Then, those who came out to play were just too girly for me,” says Yumnam Kamala Devi. One day, when a boy from the neighbourhood teased Kamala by saying that girls can’t play football, she took him on and proved her worth on the ground. A local coach, who spotted the young girl playing, was impressed by her ability to hold on to the ball and called on her to join the women’s football team that he had established. This was before she was even 10 years old. “That team lasted only a few days and I was the only player left by the end of it. But my coach came home and talked to my family about my talent. After that day, I had their complete support,” she recalls. Soon, Kamala started accompanying her father to watch local football games, even missing classes at school to play matches. 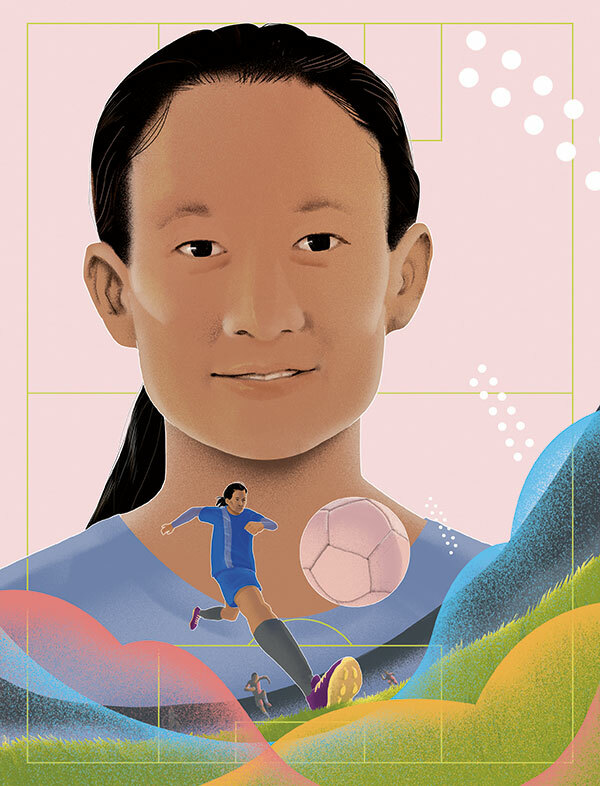 At 10 years of age, she played her first tournament; two years later she won the Best Player award when her team was crowned champion at a tournament organised by the All Manipur Football Association. The death of her father in 2004 caused her plans to waver, but she eventually continued to pursue her calling with the support of an aunt who stepped in to become her guardian. That same year, she represented Manipur at a national-level tournament in Tamil Nadu at only 12 years of age. “I was proud to play for my state and realised that I was getting closer to my dream,” she says. While she drew inspiration from the Brazilian football star Ronaldo, she also found local heroes in Oinam Bembem Devi and Thangjam Tababi Devi, whom she tried to emulate during those early days. And an insatiable hunger for goals made the forward and attacking midfield positions her favourites. “I was lucky to have had the opportunity to play with them on the same team. Nothing delighted me more than scoring and setting up goals for them,” she says. Although Kamala had been representing Manipur even before she entered her teens, her first real break came in 2008 when she was picked for the national under-19 side. And just two years later, she donned the jersey of the senior team. So far, the athlete has seen four SAFF Championship triumphs. One memory that she cherishes is the final from the 2012 win, in which she scored a goal that also won her the Most Valuable Player award. And last year, she was a part of the squad that cleared the first round of the 2020 Tokyo Olympic qualifiers for the first time in the history of Indian women’s football. The Indian Women’s League that kicked off its inaugural edition in 2017 saw Kamala play for the Imphal-based Eastern Sporting Union. It was the perfect opportunity to leave her posting in Hajipur, Bihar — where she’s employed as a senior clerk with the East Central Railway — and go back home to train in Manipur. The team topped the pool and went on to win the final, with Kamala finishing as the top scorer with 12 goals. Her efforts were acknowledged when she was awarded the AIFF Player of the Year in the women’s category in 2017. “I was so excited that I really had no words to express my feelings. The first person I called was my aunt. The award was dedicated to her, for I am the person that I am today because of her,” she says. As one of the senior members of the team, Kamala is often flooded with questions from the younger girls, but she patiently acknowledges each query to help them on the path ahead. “I tell them that if they want to be a footballer, they should forget everything else — problems at home, criticism, laziness.” she explains. “And, of course, never give up”. Read Part 2 with Bombayla Devi Laishram here.